In the fashion world, the term "effortless" is thrown around quite a bit. Everyone wants to look perfect—but also like they haven't tried at all. If there were an equal term in interior design, one that implied that sort of "I tried but I didn't" look, we think it would be "casual sophistication." The idea of casual sophistication implies both comfort and style; a home that feels purposeful but approachable, too. Unsurprisingly then, some of the most inspirational interiors that embody this look come from some of the most stylish and creative personalities on the web. To see what kind of elements, colors and textures make up a casually sophisticated home (and prove how achievable it is for you, too) we've rounded up 13 rooms that absolutely nail the look. 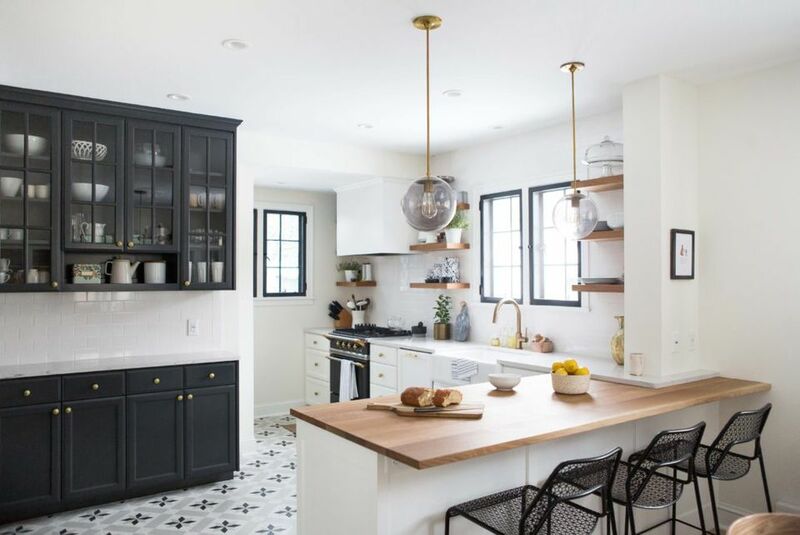 Samantha Wennerstrom of Could I Have That has created the most gorgeous, light-flooded kitchen in her California home, which she shares with her husband and young daughter. Airy all-white walls and cabinets look clean and fresh, and she's made sure not to overcrowd the light wood exposed shelving. And on the tile floor, a striped rug that echos the clean lines of the rest of the kitchen. By choosing a casual rug like this and keeping the counters minimal, Samantha has achieved a welcoming and casual kitchen that still feels polished and cool. The author of the hugely successful blog Something Navy, Arielle Noa Charnas has developed her own uniquely feminine sense of design—no doubt inspired by her taste in clothing. We love that her office space isn't bare and cold, but rather full of little touches of color and texture everywhere. From the hat boxes stacked next to her desk to the patterned rug and gold lamps, this workspace oozes luxurious charm, but feels utterly practical, too. We can't get enough of Alicia Lund of Cheetah is the New Black and her sophisticated bohemian take on interior design. She and her husband remodeled their home in Chico, California to reflect their tasteful but not overly-studied style, and the results are so inviting! A buttery leather couch like this looks extremely luxe, but when coupled with a cozy fur throw and a textured rug, the whole look is softened. The fiddle leaf fig plant in the corner is a trendy touch as well, and basically serves as the only bold pop of color in the whole room. Her accessories and pillows all work together to create a very calming aesthetic we certainly wouldn't mind coming home to each day. White interiors are almost ubiquitous these days, and we've found it endlessly interesting to see how different designers and personalities put their own spin on the trend. In the case of Jenny Radosavich of I Spy DIY, she was able to infuse this small space with casual sophistication by sticking to a color palette of natural hues like grey, caramel, cream, black and pops of green. By infusing a variety of textures, she keeps this room cozy and approachable, rather than overly curated. As proof that a coastal getaway doesn't always have to be full of whites and neutrals to be cool, check out this beach house bedroom from lifestyle blogger Will Taylor of Bright Bazaar. We're absolutely obsessed with the hunter green accent wall, and how sharp and stylish it looks combined with a striped fabric bed frame and mix-and-match bedding. This room is elegant and grown up without feeling stuffy, thanks to the unexpected colors and print pairings. It's no surprise that Emily Schuman needed to create an office space away from her home once her blog, Cupcakes and Cashmere, became a brand, a business and a bit of a sensation. In this private office space, the marks of casual sophistication are all there: great artwork (but not too much), luxe chairs in plush velvet, and a perfectly curated bookshelf full of cool and personal pieces and books. Though this photo reveals only a slice of this great room from the home of Damsel in Dior' s Jacey Duprie, it's all you need to see to get a sense of this home's aesthetic. A base of Mid-Century Modern pieces is given a fresh, almost Southwestern edge with a funky, round rattan chair and potted cactus. Bright white walls and sheer curtains play up the light, but the rest of the furniture is mismatched in all the right ways. Remember that whole thing about effortless? Yeah, this is what we mean. When you think of gold in terms of home decor, casual is not usually the look that comes to mind. And yet here, in the home of Jenny Cipoletti who pens Margo and Me, she's found a way to make this warm tone feel very casually sophisticated. How? By pairing guilded mirrors with white modular chairs, and counterbalancing dramatic golden window treatments with a toddler's tricycle in the corner. It's whimsical and cool, and looks like a table we'd love to eat at anytime. We'll go ahead and admit it, we're kind of obsessed with this kitchen in St. Paul, courtesy of Wit & Delight's Kate Arends. The contrast of the white subway tile backsplash, dark cabinets and brass fixtures feels both timeless and of-the-moment. Nothing about this room feels stiff or studied, it's an ideal mix of inviting and stylish. We could see ourselves having a quick coffee at the bar or floating seamlessly around the open kitchen space making meals for friends. You don't have to have a large home (or even multiple rooms) to infuse your abode with casual sophistication—small spaces can nail it, too. Here, Meghan Donovan of Wit & Whimsy has made a practical piece, her clothing rack, into a clever room divider. One one side she has her serene and peaceful bedroom space, and on the other, a petite living room. By keeping the tones in her studio soft and neutral with touches of grey and mirrored furniture throughout, her small space feels like a glamorous little jewel box. High ceilings don't have to mean high drama. In this home featured on The Everygirl, soft touches and a mix of textures and fabrics make this great room feel welcoming and warm. Wood walls can feel kitchy and cabin-y, but not here, when spliced with painted grey brick. Not to mention, we'd like to be invited over to sit by that modern fireplace any day. We should remind you that even though we see so much of it right now, a room doesn't have to have a white base to nail that casual sophistication we're craving. In Will Taylor's NYC apartment, he's used a soft, soothing grey paint to make this bedroom to set the tone of an absolute sanctuary. A natural hide rug invites you to go barefoot, and symmetrical nightstands, sconces and artwork create a pleasing balance.